Here’s a visual learning exercise that can help your elementary student with cerebral palsy (CP) begin to recognize his or her strengths – a precursor to what he or she may be doing as a job seeker 15 years from now. Although researchers have identified up to seven learning styles, there are actually three basic types of learners: visual, auditory and physical. Most kindergarteners are physical learners, but, by the second or third grade, their learning styles may change to visual or auditory. But, half of all students in high school and beyond remain physical learners. Visual learning involves watching to learn. Visual learners create images in their heads to remember. They enjoy art and drawing, read maps well and like puzzles. They tend to be quiet and deliberate. If your youngster responds well to visual learning, he or she will respond well to flash cards for key information, exercises which involve drawing symbols or pictures, and physical tools such as to-do lists, assignment logs and written notes. I’m definitely a visual learner. I have trouble remembering verbal directions and messages (such as telephone numbers). I notice detail, I’m aware of similarities and differences and I have a vivid imagination. Maybe that’s why I find “Handy Tips,” an exercise developed by Lise LeBlanc, coach and consultant, Connexions Vie-Travail, Moncton, New Brunswick, Canada, so helpful for me (even as a 75-year-old) . LaBlanc developed “Handy Tips” to help her clients identify their personal strengths, choose personal-experience stories to illustrate those strengths and anchor those strengths to their fingertips so they are easily accessible and memorable. This may seem like a “grown-up” exercise to help clients increase their confidence during a job search, but I see value in it for your elementary youngster also because it so visual and basic. in terms of helping your child identify personal strengths? Here’s how to make this activity work for your youngster. All you need is some unlined paper and colored crayons (5 different colors). Give your youngster a sheet of unlined paper. Instruct your youngster to trace his or her dominant hand with the non-dominant hand. This activates the left and right hemispheres of the brain. Help your youngster to identify five key strengths he or she has to offer at home, in school, in family recreational activities outside the home etc. (strengths that valued in our culture and in workplaces). 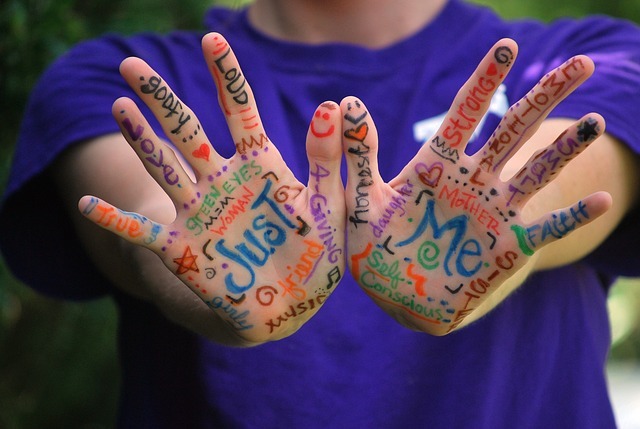 Help your youngster write down one or two words per finger (the first things that come to mind). Have your youngster pick five crayons (five different colors), one for each finger. Help draw or paint each finger in a different color. How this is done does not matter as long as five colors are used. Give time here. Do not rush. The objective is to integrate the positive words/attributes and to associate them with a color. Ask your youngster to think of specific supporting stories where the word/attribute was demonstrated fully and completely. For each finger, your youngster needs to identify one or two stories. Once a story is identified, your youngster can write a few memory jogger words at the tip of the finger -- as though the hand had rays of sunshine coming out of each finger. “TaIk out the hand.” That means asking your youngster to present his or her hand to you or another person. With the hand map in front of him or her, your youngster can present one finger at a time with the supporting story. During the time your youngster is talking about the strength and its attributed story, he or she can apply light pressure at the tip of that finger. This is called anchoring. Once your youngster finishes talking about the finger, they then go to the next and continue. You simply need to listen and not interrupt (non-verbal encouragements such as smiling and nodding are allowed). This visual learning exercise builds self-confidence in your youngster by identifying in concrete terms what she or he is “good at doing.” It also is good practice for eventually identifying strengths as a job seeker. That strength identification is sound preparation for developing a resume, and the storytelling practice is an excellent foundation for doing well in job interviews once your youngster enters the job market.